We came. We met. We went home. In one sense, the Southern Baptist Convention is like a large family reunion, complete with colorful cousins. The 2011 meeting of the Southern Baptist Convention made history, but it may take some time to measure the full consequence of the meeting. 1. The fact that just over 4,800 messengers registered, the 2011 convention is the lowest-attended in 67 years. That fact might be explained by any number of factors, but it is not good news. Phoenix was a most friendly host city, and it was good for Southern Baptists to be reminded of the work of the denomination and its churches in the West, but the city is not well placed for a large drive-in registration. Furthermore, the 2011 convention was not expected to be a contested presidential election year, nor did any matter of great controversy serve to attract messengers. Still, such a low registration is not an encouraging sign. 2. The presidential leadership of Bryant Wright produced a warm and healthy spirit to the convention sessions, and his focus on unreached and unengaged people groups brought a needed Great Commission vision to the entire convention. Southern Baptists appreciated his demeanor, fairness, and character. 3. The convention welcomed three new leaders to present their first reports — an unprecedented development. Frank Page brought his first report as President of the SBC Executive Committee, stressing the need for unity and selflessness. He invited other SBC leaders to join with him in affirming “Affirmation of Unity and Cooperation,” a statement of common purpose. He called other SBC leaders to stand with him on the platform in a public display of unity. The action was symbolic, of course, but it served as a helpful sign of Page’s leadership style and commitment to unity among SBC leaders. Never disparage a display of honest unity. 4. The mission board reports were truly inspiring. Tom Elliff was in full enthusiasm as the new president of the International Mission Board. Holding a commissioning service as part of the IMB report was really inspiring, as was the call for each Southern Baptist church and entity to “adopt” one of the more than 3,800 unengaged people groups. Kevin Ezell broke all precedents in bringing his first report as president of the North American Mission Board. He spoke with a much-needed honesty about the need to redirect the agency he leads and he spoke with bracing candor about the need for Southern Baptists to plant real Baptist congregations that reproduce. His report was a display of courage and trust in the convention and its churches. 5. The ethnic diversity statement recommended by the Executive Committee was both right and important. The action included ten very specific steps that are “designed to foster conscious awareness of the need to be proactive and intentional in the inclusion of individuals from all ethnic and racial identities within Southern Baptist life.” The points were clear, bold, and necessary. Our Creator takes ethnicity, language, and culture seriously — even describing the assembly of heaven in these terms. Our nation is becoming more ethnically diverse by the day. The Southern Baptist Convention must do the same, lest we become a mere enclave that looks like the America of the past, rather than of the present and the future. 6. The Committee on Resolutions, led by South Carolina pastor Paul Jimenez, brought a brave report that included a resolution on immigration — an issue that was sure to attract discussion. The resolution produced the most intensive and controversial debate of the entire convention. 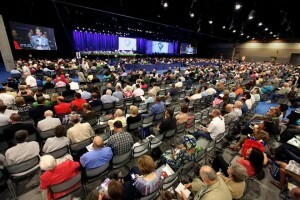 In the end, the resolution was adopted, calling for the nation “to implement, with the borders secured, a just and compassionate path to legal status, with appropriate restitutionary measures, for those undocumented immigrants already living in our country.” More importantly, the resolution emphasized the Great Commission and Gospel priorities of the Southern Baptist Convention’s churches in addressing the millions of immigrants that now represent such a large and growing evangelistic challenge. 7. The convention also adopted–overwhelmingly–a resolution on the New International Version of the Bible [NIV]. This resolution, which “expressed profound disappointment” with the recent revision of the NIV, did not come from the committee, but from a messenger who appealed to the convention for his resolution to be considered. In not bringing the resolution to the convention, the committee was following established precedent, whereby the convention does not repeat previous actions. In 2002, the convention adopted a strongly-worded resolution against a previous revision of the NIV known as the TNIV. The committee did its job well. The NIV resolution demonstrated both the glory and the risk of our democratic system. The glory was seen in the fact that the resolution clearly expressed the concerns held by the overwhelming majority of messengers present. The SBC sent a clear message of its proper and valid concerns — and a message that will be heard far and wide. The risk involved in adopting a resolution right from the floor of the convention was also revealed in the fact that the statement called for LifeWay to discontinue sales of the NIV in its stores. As a matter of established precedent, convention messengers do not send messages or directives directly to the entities of the SBC. The resolution couched the language in terms of a respectful “request,” but the action represents a very difficult challenge for LifeWay and its leadership. Removing the NIV from LifeWay stores is no easy matter. Just consider that the New American Commentary series, encouraged by direct action of the SBC in the 1980s, is based upon the NIV translation. This series was intended to showcase conservative SBC scholarship. Is LifeWay now to remove its own prize product? There is no way that the series can be shifted to another modern translation without rewriting every volume. The NAC is but one example of the quandary now set before LifeWay, but the larger issue is moral — consistency. How can LifeWay justify removing the NIV and leave even more problematic translations on its shelves? Many of those translations are also deeply invested in the very study and devotional materials that Southern Baptist churches demand and desire. In the end, Southern Baptists will have to trust that LifeWay will be faithful to its charge and stewardship from the Southern Baptist Convention. We should all pray that LifeWay president Thom Rainer and the LifeWay board will be granted wisdom to know how best to serve the churches of the Southern Baptist Convention in light of this resolution. In the end, I think it is healthy and good that the SBC sent such a strong signal through this resolution. I only wish that the resolution would have avoided some of the difficulties it now creates on the way to making its main point. 8. There were the moments of unpredictability, proving that Southern Baptists bring some colorful relatives to the family reunion. Wiley Drake nominated himself as President of the SBC, receiving 122 votes (presumably one of them his own). This recalled the self-nomination offered by evangelist Anis Shorrosh at the 1988 SBC in San Antonio. Shorrosh nominated “our dear friend” … himself. Questions and responses during entity reports (including my own report for Southern Seminary) offered moments of unpredictable energy. 9. In the end, the Phoenix convention reminded Southern Baptists that we are facing a huge season of generational transition. This will almost surely be the greatest test the SBC will face in coming years. Will we handle this well? The road from Phoenix to the future will answer that question. Photo credit: Baptist Press, 2011.